It’s truly a wonderful journey, albeit it not an easy one. I hope you join me on this little blog to talk about the beginning, the middle and the many bumps in the road of being a dad. And if you’d like to share your story on StarterDads.com, please email StarterDads@gmail.com. I’m sick of hearing about Ryan Lochte. Overall, I’m sick of entitled idiots getting in the way of a good time or taking the spotlight away from people who’ve earned it. So this is the last time this article will mention his name. Instead, lets focus on the athletes that have proved themselves as strong, determined and selfless. Brianna Rollins, Nia Ali and Kristi Castlin took the Gold, Silver and Bronze, with Rollins in the lead with a 12.48 seconds finish. For the first time in modern Olympic history, a women’s team swept a track event. All 61 prior sweeps were recorded by men’s teams, with the most recent being the 400m and 400m Hurdles at Beijing 2008 Olympics. In the Bronze match against Sweden’s Nikita Glasnovic, Zenoorin outscored her opponent to take home the medal in Women’s Taekwondo. Nicknamed “The Tsunami” in Iran, her achievement is significant as she becomes one of a handful of women to compete for Iran at the Olympics since the Iranian Revolution in 1979. Zenoorin is already well-established in Taekwondo, at the young age of 18. In 2015, she won both the bronze medal at the 2015 Taekwondo World Championship and gold at the World Taekwondo Grand Prix. As ever, Ashton Eaton’s determination and positive spirit continues to leave an impression among all those around him. He lead through the first 8 events of the Olympic Decathlon, but faced tough competition from Canada’s Damian Warner and France’s Kevin Mayer. At the pole vault event, there was definitely a feeling Eaton’s lead would be in danger when Mayer successfully completed an insane 5.4m attempt that surged him past Warner, into second place. But at the final event, the 1500m, Ashton’s composure paid off, as he used strategy to remain within 7 seconds-pace behind Mayer, in order to safegaurd his decathlon gold. At the final stretch, Ashton pulled ahead of Mayer, and finished the decathlon with 8,893 points, a new Olympic Record. Olympic medals aren’t what it’s about. Even making it to the Olympics isn’t what it’s about. As you can see, even assholes can make it to the Olympics and win. The Olympic Spirit, the merit of the games, is defined by how its standard-bearers treat one another. There’s no better example of that spirit than America’s Abbey D’Agostino and New Zealand’s Nikki Hamblin. At the qualifying heat of the Women’s 5000m, Hamblin unexpectedly fell and took some spikes to the back of her right thigh. Before anyone knew it, Abbey D’Agostino toppled over her, injuring her knee. “Get up. We have to finish this.” Those were the words Abbey uttered to Nikki, helping her to her feet as they attempted to finish the race together. For the two, it was no longer about winning; it was about showing the World what mental toughness can achieve when you work together. The IOC rewarded both an opportunity to compete at the 5000m final. Hamblin was able to compete, with her shoulder, thigh and ankle injuries – she finished dead last. D’Agostino watched from the stands, suffering a torn ACL and meniscus. For us mortals, way beyond the age or physical ability to compete at the Olympic caliber, it’s the random acts of kindness that ring truest because it doesn’t take being an athlete to do good in this World. My God; this looks amazing. For all the baker dads out there! Thank you to Italian Home Kitchen! Many people wish they could bake delicious homemade bread, but they think that the process is too cumbersome or that only professional bakers are able to produce a satisfactory loaf of bread. Fortunately, this is certainly not the case. At Italian Home Kitchen, we’ve got the perfect recipe to get your started. A delicious loaf of Irish Soda Bread is not only easy to make, but it requires only the simplest of tools and ingredients. These are things almost everyone already has on hand. This recipe leans more towards a traditional Irish Soda Bread, rather than the more Americanized and sweeter version that many people have become accustomed to eating. Real Irish Soda Bread is made with Irish wholemeal flour, similar to a coarse ground whole wheat flour that is used in many American kitchens. Jacob deGrom has been banged up a bit his last two starts, so it’s great to see him pitching 7 innings (so far) with 9 Ks and 1 earned run. And with the bats in support, the Mets are winning 5 – 1 against the Orioles. All great news! So I figured what better time than now to reflect that just last Saturday, May 2nd (ahem, My Birthday! ), was deGnome Day! I truly loved this idea. Traditionally, MLB teams “Bobble Head” their star players, but I am really liking this new spin on baseball memorabilia. This is the second only gnome that a MLB team has released as a promo item, the first being Jayson Werth of the Nationals. Oh, and I’m a huge sucker for anything free at baseball games. Once, at a Nationals home game, I was all about the free t-shirts shot out of the t-shirt cannon. Fun Fact: A foot-long hot dog is wrapped within the Nationals Park t-shirts; some sort of weird tradition that I wish I knew about before leaving the shirt in my bag for a few days! But I digress…My wife, Cathy, brought me to the Mets/Nats game on May 2nd, and I was very happy to be able to grab two deGnomes. One of course, will be mine, which I will call my precious and keep in the box as a collector’s piece. 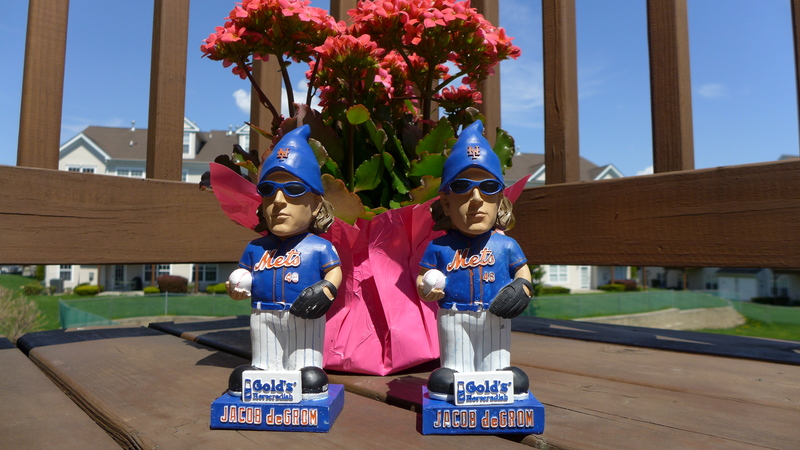 So far on eBay, the Jacob deGrom Gnomes are selling for over $45! Jayson Werth’s can go over $150, so I’m hoping as long as he does well, the deGrom Gnome won’t de-Value. The other will be going to my son, Jack. I’m a huge collector of everything Mets, sci-fi, geek and pop culture, some of which I’ll get into in future posts. It’s really important to me to have traditions and be able to pass on those traditions to Jack. Although I loved my Dad, something that sticks with me to this day is we never had a recurring thing that we could bond over. I don’t want to be that kind of dad with Jack, so I want to bring him to Mets games and collect bobble heads, gnomes, baseball cards and anything else that him and I can identify our relationship with. I know he’ll grow up one day and not have time for all my “traditions,” but that time is still a long ways away, so I don’t need to think about that just yet! In the meantime, I can remain an oblivious dad that assumes my son will love everything I love! Oh, and I also got to see my 50th Anniversary Brick, which again, my loving wife gave me for Christmas 2012. Cathy is a lot of things but most definitely a patient woman. After all, she has to deal with me on a daily basis! She’s also a Yankees fan, so this is a pretty big deal for her to put up with my Mets obsessions and come to games with me. 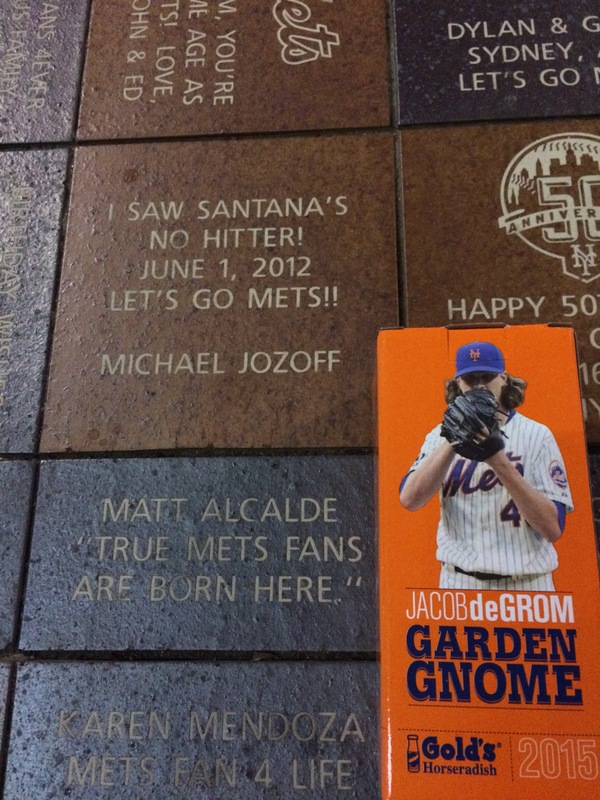 I know she’ll try to make Jack a Yankees fan, but the brick speaks for itself: True Mets Fans Are Born Here. Lets Go Mets!